This is my favorite and most frequently baked cheesecake......highly pleasing taste! #Not too sweet...with chocolate chips and walnuts..Just nice to go with a cup of coffee. Muffin with cream cheese filling and topped with chocolate chips. You know why? Cause it's baked by myself....wahahahahaha..
Leave me a message if you want to place for an order. Ole~~Ole ole Ole~~~My love at first sight! I passed by this restaurant "Ole Ole Bali" while walking to Halo Cafe for a gathering last Saturday. And the cozy decor captured my heart immediately. If you wanna try some Balinese cuisine, you got to try this place out! The authentic Balinese cuisine served is definitely worth your money. I opt for their Balinese specilities, which is the Balinese BBQ Chicken (Siap Megoreng)- Deep fried Lemongrass marinated half chicken with sambal terasi, and as for Shyong, he had their Balinese Roast Chicken with Lemongrass Marinate (Siap Mepanggang). Both servings were great and they served in huge portion, so if you are a small eater, then you know what to do! Besides Balinese cuisine, they offer Western Food which looks obviously tempting as well. They have burgers, sandwiches and steaks. But, their Balinese Decor and the name of the restaurant has obviously attracted me to try their Balinese cuisine. After all, the environment and ambiance of the place is welcoming and perfect for either family gathering or a quiet dinner for two! 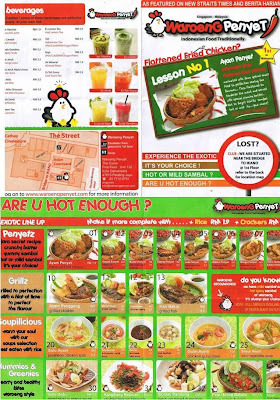 If you have been staying in KL or PJ for quite sometimes, or perhaps if you are a local, I am sure you have been made known to this place by your friends or relatives. I was brought to this place few years back by my sister for seafood. 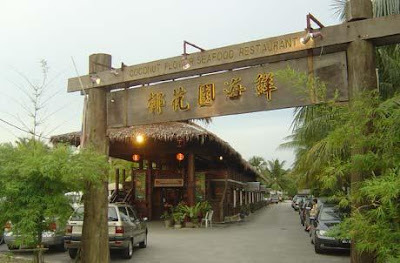 The restaurant's name is Coconut Flower Seafood Restaurant. So, why coconut flower? Well, it's because this place is also famous with its toddy servings/palm wine which in mandarin we called it as 椰花酒。If directly translated into English, 椰= Coconut and 花= Flower, which also bring the meanings of toddy, as toddy are fresh juice obtained from the blossom of the coconut, palm or sugar-palm, which can be made into sugar or the said palm wine. And maybe this is the reason why this restaurant is nestled in a coconut plantation. I dont like toddy! Although I drink, but it smells bad for me....but I do have friends who really likes toddy! Well, what about their seafood? If you want to try cheap seafood which taste just nice, perhaps this is the place where you can visit. The Lala Fried Mihun is one of their signature dish which only cost RM 6.00. My favorite dish, fried Kang Kung Belancan turns out to be the worst I have ever tried! But, thumbs up for their Assam Squid and their Fired Oyster with Eggs in Pan....oysters were delicious! Both cost only RM 13.00 & RM 9.00 respectively. I am a person who likes to compare....so for me, I still prefer seafood in Tanjung Harapan which is located in Klang's North Port! However, Coconut Flower Seafood restaurant is still worth a try!